The iPhone 6s is in full sales motion, which means the cases season is wide open for manufacturers to take advantage of. A particular favorite of ours are the wooden back cases, which are full of natural charm and present unique properties such as special wood grains and enviromentally friendly manufacturing, not to mention some are adorned with fantastic graphic patterns. Most of them are hand-crafted, too, and as impressive as a Spigen armor case might look, it cannot match the natural elegance of a product made with bare hands. There you go, have a look at these 10 fantastic wooden cases for the iPhone 6s. Which one do you like best? Crafted from sustainably sourced wood and lightweight polycarbonate, the #WoodBack Case by Cover-UP is a beautiful blend of technology and natural wood grain. Designed to protect your iPhone 6s and enhance its appearance. The Peroa Check 100% Natural Wood Case for iPhone 6s offers good protection and adds an unique, trendy look to your iPhone to make it stand out from the crowd. It features a Boho style finish, a slim and streamlined design, and a combination of wood & eco-friendly finishing materials for natural beauty and environmental sustainability. The case is designed and crafted in Korea. This case offers a hand-finished real wood cover that's combined with a polycarbonate case, making it easy to snap on and protect your device. This is a slim, stylish case that's designed to protect your iPhone6s and showcase the beautifully finished wood. The case is hand-crafted in Elkhart, Indiana. A perfectly natural complement for your state-of-the-art iPhone, the case offers reliable protection as it's made of hard and durable wood that also happens to be beautiful to look at! A stylish, yet protective case from Unique, this one lets you slide your iPhone into it and have it held firmly in place, protected by a hard shell and assured that your phone remains protected at all times. The inside of the case features a soft microfibre lining, which protects your phone's screen from scratches and dirt. Bonus: classy wood panel detailing. A brand new case that's developed for the iPhone 6s, this one wraps perfectly around the smartphone's curves. These cases are crafted with precision and care out of wood obtained from well-managed forests and FSC certified supply. 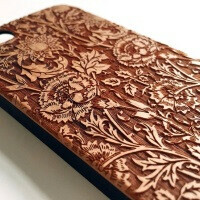 This is an engraved iPhone case that gets made one at a time using laser engraving. The artwork gets engraved on the real wood back plate of the phone case, while the other part is made of matte finish black plastic. These cases are hand-made, so it's natural for them to have slight differences in wood color and position. The iPhone 6s case is made of wood, soft TPU rubber, and plastic. With a simple, yet stylish and elegant look, the case fits the iPhone 6s precisely and it allows for easy button operation. The case provides full all-around protection to your iPhone from bumps, drops, and scratches. Meanwhile, its cut-out back shows the Apple logo imprinted on your iPhone. Made out of genuine wood, this case has a thin slip integrated with the back case, making it great for also having some money and cards on your phone. The construction leaves no seams between the wood and rubber base, while the natural wood grain gives every item an unique look. A rubber bumper with anti-slip air holes provides the final touch. What about Toast? It would definitely be my pick since it's almost a skin instead of a case. Do you got wood? I got wood! What about the cases made from recycled skateboard decks. Those looked so much cooler than these. I like the number 6, it's simple and match the black color.